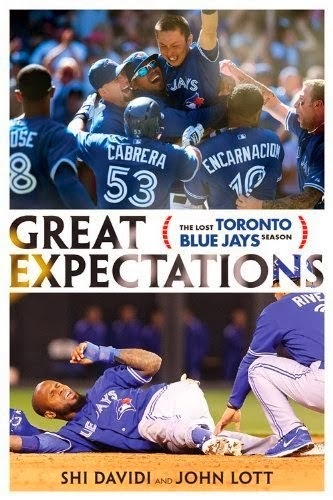 The Tao of Stieb: I Read This Book - "Great Expectations: The Lost Toronto Blue Jays Season"
I Read This Book - "Great Expectations: The Lost Toronto Blue Jays Season"
When I learned that the Toronto Blue Jays' 2013 season had been documented in book form, I'll confess that my first reaction was somewhere between nausea and dread. In that moment, I couldn't imagine reliving the season that had just passed, nor did I care to dissect it any further. At some point, you have to move on. It didn't help matters that at the time the book's imminent release was announced, John Farrell and the Boston Red Sox were barreling their way through the playoffs towards what seemed to be an increasingly likely and awful capper to what was the franchise's most miserable season of the past three decades. With a day or so of respite after the end of the World Series, and with a gaping hole in terms of baseball content in my life, my morbid sense of curiosity got the better of me and I relented. Fine. I'll read the book. I'll go through the entire ugly mess again. If I was to subject myself to such a trial, it certainly helps to know that Great Expectations: The Lost Toronto Blue Jays Season was penned by Sportsnet's Shi Davidi and the National Post's John Lott, the two beat writers whose work I most consistently read on a daily basis. So I read it. And I lived to tell the tale. I think I might have even learned a thing or two. Here are my thoughts. In a time when the notion of "narrative" is so roundly disdained among the more censorious and persnickety of baseball analysts, it's to the credit of the authors that they've mostly steered clear of a straight chronological retelling of the season. I'm sure that there's a temptation to build sequentially through the schedule, creating a story with a central explanation for the downfall of the 2013 Blue Jays, but such an exercise likely serves to obscure the truth rather than uncovering it. Lott and Davidi smartly employ a style of the writing leads readers back and forth in time, through a circuitous path of personalities and events that ultimately influence the season. They highlight a few of the more notable Blue Jays - or at least the most talkative ones - digging back into their origin stories, how they made their way to Toronto and eventually through to what their impact on the ill-fated 2013 season was. Between those stories, they patch in aspects of the manner in which the season rolled out, mostly focusing on the events that you would expect: The Kawasaki walkoff, José Reyes' ill-fated slide in Kansas City, Bret Lawrie's freakout after Adam Lind didn't score on his shallow fly ball. There's some nice contextualization that happens around these events, both in terms of how they happened, as well as some hints as to the blow back behind closed doors. But beyond those moments, it's clear from the recounting that the season was very much a leviathan, much larger than the sum of the actions of the mangers or players. In the retelling, it almost seems as though the 2013 season was something that happened to the team, as though they were at times looking at their season from a distance even as they were in the middle of it. To that point, the book is at its best when it examines the way in which the team was assembled in the offseason, and how what might have looked somewhat like a "plan" was actually more a series of happy accidents and missed connections. It drives home the point that the Blue Jays certainly sussed out other possibilities, including moves that might have been more advisable, given the benefit of hindsight. But as those parts of the book demonstrate, the Jays are but one player among many, and at times faced with different timelines and levels of urgency than their trading partners or free agent targets. Call me an apologist - again - but the book leaves the impression that the most astute, deliberate and strategic foresight in building a team is ultimately as vulnerable to be undermined by dumb luck and injuries as any random collection of players. Which is oddly reassuring, but also disquieting if you have any notion that you're going to plunge your soul optimistically back into another few decades of fate's indifferent spirit grinder. Firstly, I found a lot of my anger and antipathy - remember this post, written in a fit of pique? - melting away as I worked my way through the book. In particular, I felt myself gaining a greater appreciation for R.A. Dickey, who I had grown to resent during the season for the verbose strings of excuses that followed each start. In the book, there's a greater sense of humility from Dickey in particular, and there's a more philosophical bent to some of the comments from some other key players. In a sense, it made me feel eager to see them back in action. There is something of a gap, though, in terms of insight on the seasons of Adam Lind and J.P. Arencibia. I can certainly understand the rationale for why the gaps may exist, given that the former seems not to be a very good interview, and the latter cut himself off from the media for a significant portion of the season. Still, theirs were two of the more interesting stories to emerge from the 2013 season, and the book would have been a richer experience if there were some greater understanding of how one found a semblance of respectability while the other fell just about as far as is conceivable. But those are minor quibbles. Given its speedy turnaround time and narrow focus, Great Expectations is an ample and observant recap of the past season, with enough insight to sustain your baseball love through the offseason, and enough wisdom to temper your outlook through the roster refresh that is sure to come this winter.